The 2-channel OMB-DBK4 dynamic signal-input card enables OMB-LOGBOOK and OMB-DAQBOARD-2000 Series data acquisition systems to accommodate inputs from piezoelectric transducers, such as accelerometers or microphones, as well as from various other dynamic signal sources. Each OMB-DBK4 card is equipped with two BNC connectors and footprints for two user-installed Microdot connectors, permitting it to easily accommodate most transducer connections. 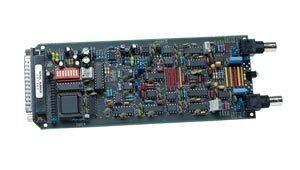 The OMB-DBK4 provides per-channel, constant current source outputs, programmable gain amplifiers, programmable anti-aliasing filters, and sample and hold amplifiers. Output Impedance: >1.4 M .
Input Impedance: 150 K .